The first meeting will be on the discussion about the consultation/project to be done. We ask for some basic information about the site i.e. the size of the premises, location, number of floors etc. We provide our quote based on the above information. You can select any convenient vastu service from our On-site consultation, E-Mail consultation or Skype consultation services. We need a Floor plan (accurate or hand sketch) as well as complete data of the premises and the occupant to proceed for the next step. In case of consultation via email, we ask for details about surrounding of the site i.e. road, river, mountain, electric poles, trees, junctions, religious place etc. for vastu reading. Most important part of vastu analysis is taking an accurate compass reading and determining in which direction your main entrance is facing. This is one of the most important factors while making a vastu layout for the house or office. Without an accurate compass reading, vastu analysis would be guesswork. We verify the measurement provided on the map with the physical verification to have a very precise reading. Our detailed analysis and evaluation will be based on the application of 21 vastu energy efficient techniques developed by a team of Vastuplus. These methods are very simple, easy to implement and highly result oriented. We use analytical tools like Bar Charts, Vastu Grids & Vastu Grading table. You will receive a written evaluation presentation including recommendations for implementation. Generally, a complete analysis and consultation report take approximately one week for on-site consultation and four days for email (long distance) consultation. 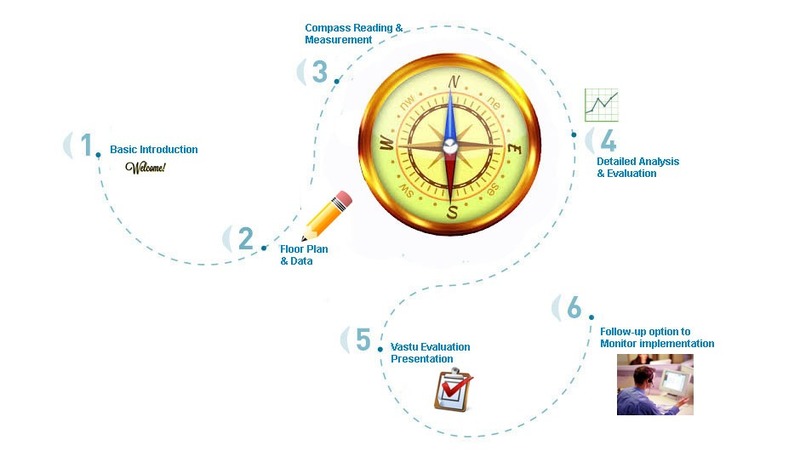 We provide a follow-up option which monitors the effectiveness of the vastu implementation. We are based in Mumbai, so, if you are located other than the above area or live overseas, the consultation will include traveling & accommodation expenses (in case of site visit) on actual basis. Nitien Parmar Chief Vastu ConsultantNitien Parmar is supported by the team of experts who looks after vastu designs, Clients Feedback, I. T., Marketing and back-office work.